Robometricschool. 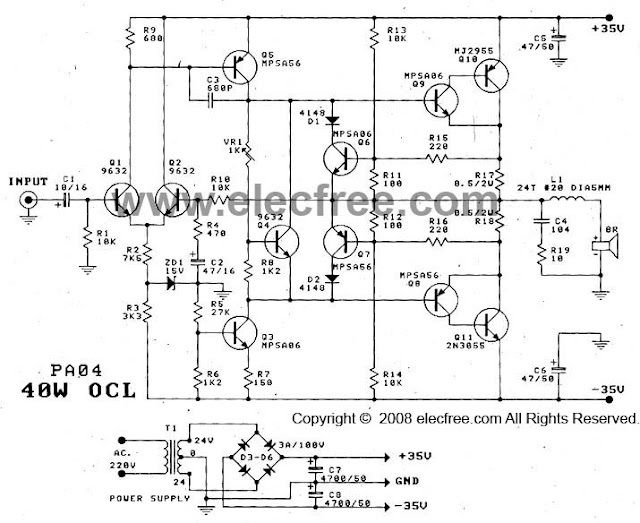 - Maybe you very familiar with power amplifier OCL using pear of 2N3055 and MJ2955 transistors. It is look very easy to build this power amplifier because there are many circuit reference this power amplifier. One implementation of OCL 2N3055 and MJ2955 is to build 40 Watt transistor audio amplifier with using power supply 0, -35V, +35V with 2A transformer minimum. This power amplifier can be connected directly to VCD player, radio, or using adjusting tune like tone control. To know the circuit schematic of 40 W transistor audio amplifier using OCL 2N3055 and MJ2955, you can see it in Figure 1. below. You can mentioned the main transistors in this circuit is pear of 2N3055 as the NPN transistor and MJ2955 as the PNP transistor. Figure 1 above show you the 40 W transistor audio amplifier using OCL 2N3055 and MJ2955 transistor. Accordingly Eleccircuits that also published this circuit mentioned that this circuit is one that stands out for ages over 40 years, with sound quality that is hard to find compared be other circuits. If you experimental build or ask people who try already built. Will believe that this is not as exaggerated statement more than true. This power amplifier series circuit, be able to output of up to 40 watt on load 8 ohm, and will provide output capacity of up to 60 watt load 4 ohm. The circuit design an All complementary all direct coupling (except the input), Making low frequency response of the circuit well. The transistor(MPS9632) Q1, Q2 together to as a differential amplifier, By has R10,R4 and C2 together constitute the feed back circuit and defined an all gain ratio of circuit. At emitter circuit has zener diode is connected as maintain a constant voltage 15V. The transistor Q5 is the part second amplifier circuit, by has C3 is to feedback between pin base and collector, for prevent procreation oscillator way high frequency. Q8,Q9 acting as the driver circuit to drives the power transistor Q10(MJ2955),Q11(2N3055). For Q6, Q7 acts as the output transistor protection circuit from damage. Because the current flowing through the load too much such as a speaker cable short-circuited, by will acts as short the bias circuit of the output transistor is reduced so that it not works. Q3 serves limit current, the general bootstrapped circuit that use the RC. for Q4 acts as setting bias level of the output transistor which which be instead Diodes same the normal amplifier circuit. This connection reduces the crossover distortion as well. VR1 serves as to adjust a bias voltage the idle current to the circuit.